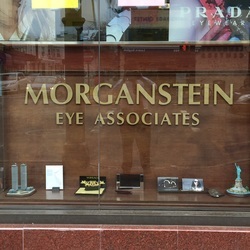 Morganstein Eye Associates is a well established Optometric practice that was started in 1952 by Dr. Hiram Morganstein. Dr. Morganstein practiced general Optometry in West New York and was joined by his wife Pearl who was the general office manager until her death in 2002. They worked hard to build a modern Optometric practice filled with all the latest equipment and technologies available. After her own studies were completed, their daughter Audrey joined the office staff doing general office duties. She still holds this position today and is a valuable asset to the office. In 1993 Dr. Richard Morganstein joined the practice and brought many new and exciting ideas to Morganstein Eye Associates. In the summer of 2004, Morganstein Eye Associates underwent a huge renovation under the guidance of Drs. Hiram and Richard Morganstein. The office was closed for six weeks and a whole new physical plant was built at 5618 Bergenline Avenue. Now there is one of the most modern and well equipped Optometric offices in the State of New Jersey here in West New York. Dr. Richard Morganstein is available full time to provide full scope treatment and management of all your ocular needs. Thanks to the hard work of everyone at MEA we now see many generations coming through our doors. It is our pleasure to provide the best quality eye care available today. We provide everything one could need -- from eye evaluations to eyeglasses and contact lenses. It is our intention and stay as a fixture in West New York for many years to come. Mory Rosario, Anamari Ortiz, Audrey Morganstein and our optician Rodolfo Rodriguez will continue to provide quality service and eye care which has become the hallmark of this long established practice. It is with great joy and pleasure that we look forward to seeing all our familiar patients and all the new people who intend on joining our family in the future.